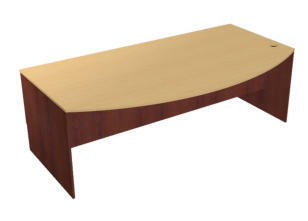 Polyboard is a unique & powerful tool for standard furniture ranges and custom fitouts. In the Office furniture industry Polyboard allows you to quickly and easily customise office fitouts. Unlike other software packages that are based on fixed cabinet libraries, Polyboard gives you the full control over the manufacturing and construction process allowing you to create designer furniture to any specifications. Polyboard does it all: Great on-screen display graphics, full control over design and the ability to export 100% of your design to a CNC machine with complex part shaping, boring, cut-outs and other machining - all in 3D with 100% accurate costings for each component right down to the last screw! 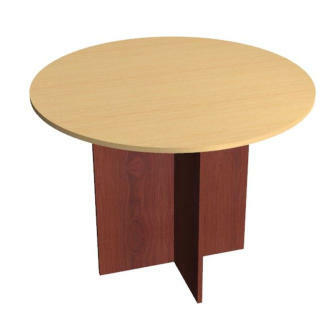 Easily design standard office furniture Standard office furniture is a breeze with Polyboard! Easily create desks credenzas hutches returns, bookcases and meeting tables in next to no time Polyboard allows you to define furniture styles and manufacturing methods that will allow you to create furniture pieces from scratch very quickly, or if you prefer to work form a standard library of items You build one piece say a desk or bookcase, duplicate it, make changes and watch you’re own personalised furniture library grow in next to no time! 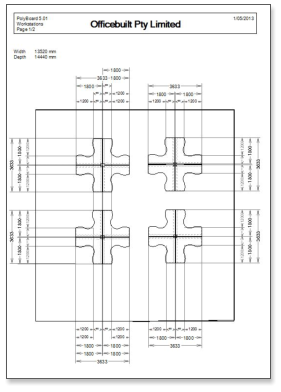 Easy design your machining and drilling requirements. Polyboard has fully parametric hardware generation no matter what brand fitting or type Polyboard can set it all up automatically. Polyboard can easily define hardware such a edge-boring cams, face bored cams or even fixing screws. Hinges can be set up to be match the drilling configuration of any hardware supplier such as Hettich, Blum, Grass etc..
↓ Desks are easily designed in Polyboard complete with built in drawer boxes! 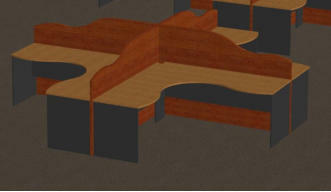 ↑ Credenzas with or without hutches can be designed and all drilling and machining is easily viewable on screen. 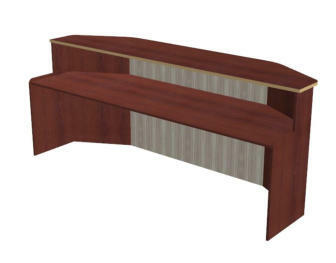 Polyboard offers easy methods for shaping furniture and parts easily create shaped office furnishings such as: o Curved front desks o ‘P’ - shaped desks o Workstations with ‘natural’ work curves o shaped cut-outs for cabling and power point connections o Reception desks with multiple panel fronts and curved side panels. 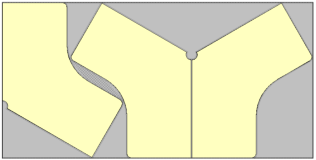 Once these furniture items are designed. they remain fully parametric, which means, even though they have complex shapes that you can still reuse the design for subsequent jobs by duplicating and modifying the overall dimensions to use design and shape but with different overall dimensions. 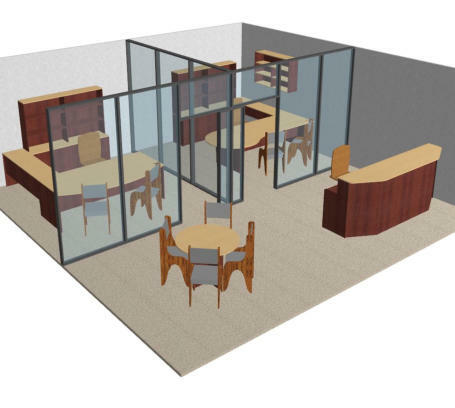 Design office layouts and present them to customers in both 3D rendered as well as fully dimensioned plan drawings. 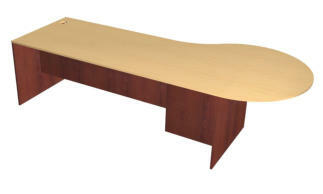 ↑ Bookcases and meeting tables whether they are square or rounded can be designed and manufactured. Furniture is beautifully rendered on screen prior to production. Polyboard gives you the freedom to design and be creative in furniture production easily create curved products such as bow front desks and meeting table desks. 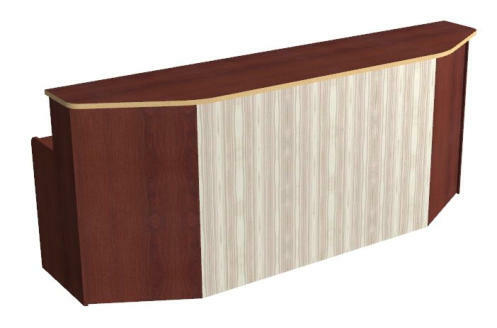 Reception desks with multiple sides such as this unit with 6 sides are easily designed in Polyboard. 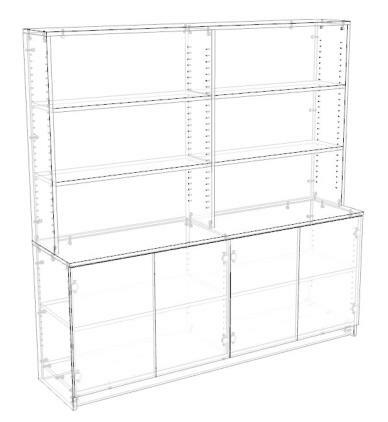 ↑ Workstations with complex shapes are easily modeled and manufactured in Polyboard. 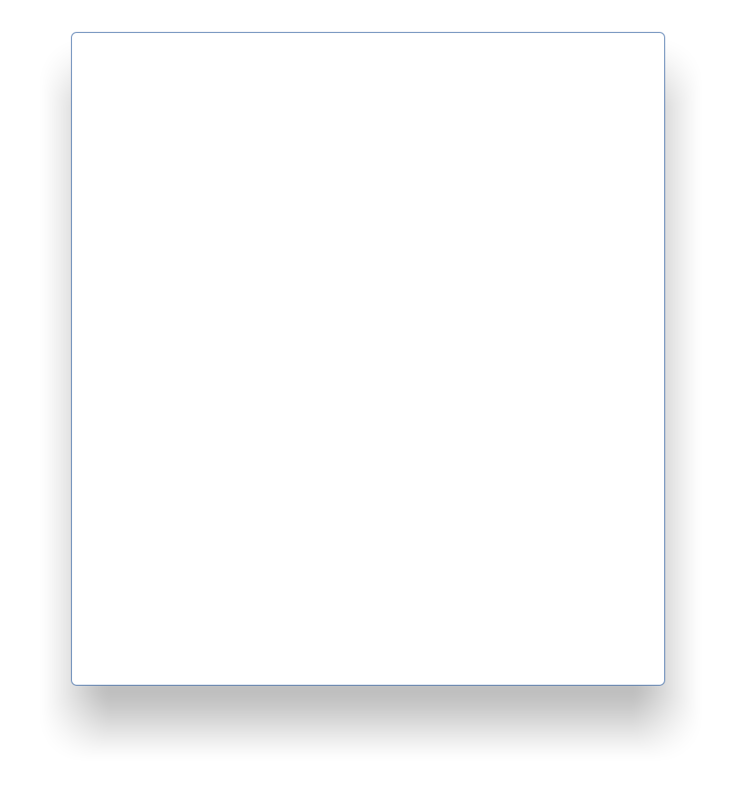 ↑ Polyboard automatically produces multiple view drawings of all your designed items. with views fully customisable. 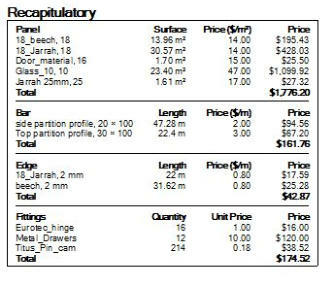 120 Degree workstation tops nested into a single 3.6 x 1.8 sheet by Optinest! 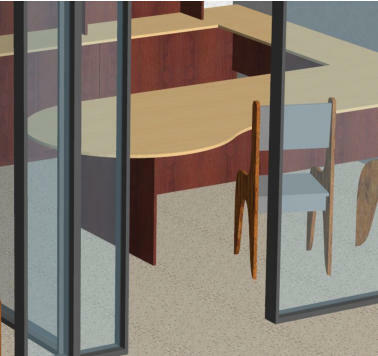 Office layout part drawings & renderings : Polyboard produces nice 3d rendered graphics that will demonstrate your office fit-outs to your customers, with full rotation and zoom controls. In addition to 3 dimensional rendered views, manufacturing plans and dimensioned drawings are also able to be generated. 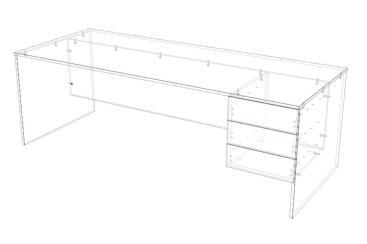 Multiple view drawings of furniture items or complete office layouts are automatically produced as well as detail individual part drawings showing all machining requirements. When design office layouts, Polyboard also gives you the option of adding in your own dimensions to show special features of your designs i.e. space between cupboard and doorway or space between a cupboard and a desk to show that there is adequate space to open doors, and move chairs about. 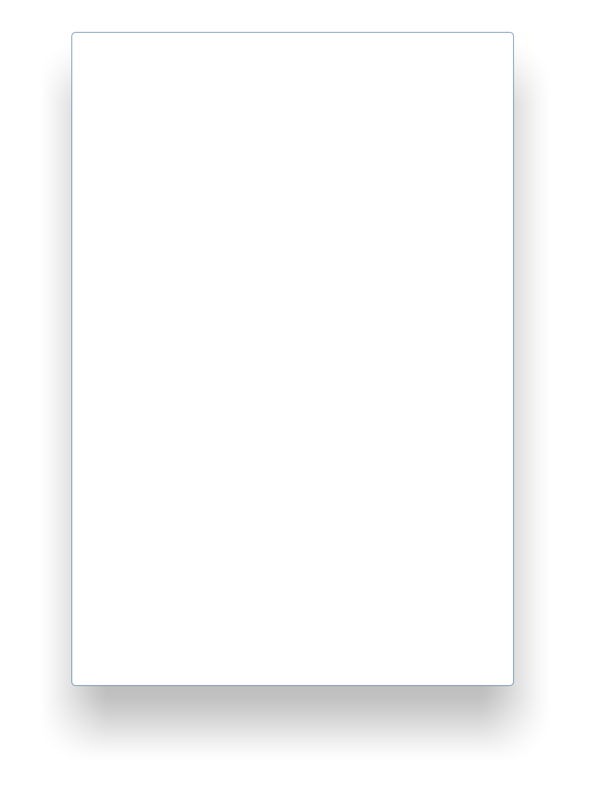 Parts can be made semi-transparent to show cabinet internals and there is also a feature to animate the opening and sliding of doors and drawers. Reports and Detailed Job Costing: In Polyboard the ability to generated detailed costing reports comes as standard. 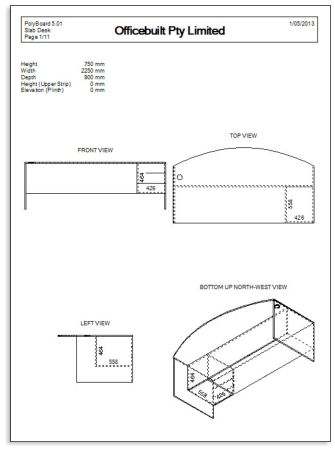 This feature itemises all the components and materials that go into your fit-out. The reports will help you with both understanding the cost of your job so you are able to quote properly, but it will also assist you in the ordering of components from suppliers for each job. 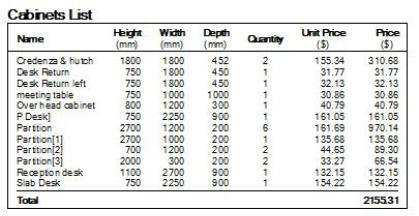 o All panel materials have a cost / square metre and thereby Polyboard calculates total cost for each material used including surface laminates like those applied to kick-boards. o Edgebanding is costed by the metre and total edgebanding used for each type of tape is calculated and added up. 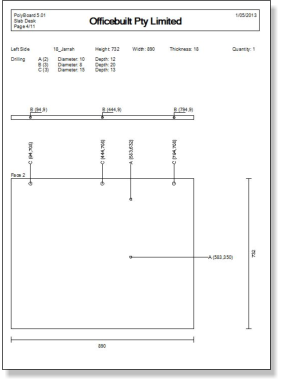 o All hardware fittings are totalled and costed separately giving you accurate both knowledge of what items are in each job, and the total cost. all items are included; adjustable shelf support pins, hinges, drawer runners / sides, as well as pins and cams. Polyboard Also will generate a report that will itemise all the cabinets used in a job. 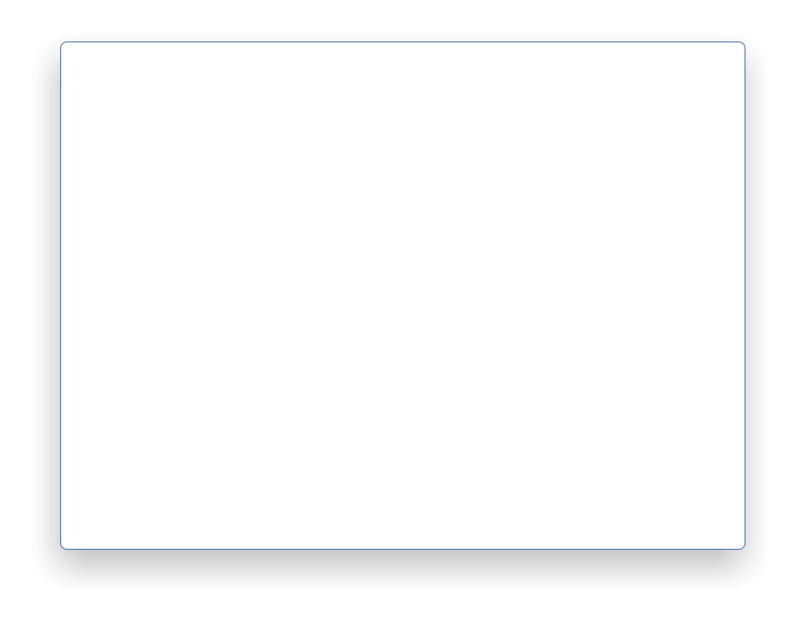 that would be useful to be use as a truck loading list or even for general quoting purposes. Production add-ons and Machine connectivity: Polyboard in addition to the detailed printed reports Has a very powerful machine post processor. The post processor is able to produce customised machining files in a variety of formats: dxf, CID, XXL, MPR files of all parts. these part files can be imported by virtually all machines and cam packages. While Polyboard can integrate well and connect easily to third party Sheet optimisers nesting software and cam software. Users of Polyboard also have the opportunity to upgrade to our own Nesting and saw optimisation software Optinest and Opticut. Having your optimisation software come form a software export will not only give you better optimisation results (and money saved) but will give you loads of extra features that third parts add on software simply can’t match. So no matter weather you produce your fit-outs using panel-saws, beams saws and Point to point cnc machines or you use the nested based manufacturing method our range of add-on software will connect seamlessly to your machine. and have you working very efficiently.